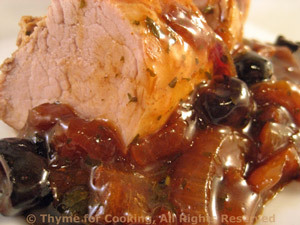 Pork Tenderloin, Braised, Red Onions, Thyme for Cooking easy gourmet recipe. Whole, braised pork tenderloin makes an impressive main course. The browned red onions and Greek olives make a savory sauce, almost like a confit. Peel and thickly slice red onion. Pit olives if needed and cut into thirds. Heat oil in a medium skillet. Add onion and sauté until well-browned, about 20 minutes. Move to the side and add whole pork tenderloin. Brown well on all sides. Add wine, stock, paprika, parsley and olives; cover and simmer until done, 20 - 25 minutes. Remove pork and increase heat under skillet. Add cornstarch, stirring until thickened and clear. Slice pork, spoon onion-olive sauce on the side and serve.